Now that all NFL games since 2000 have been added to the Win Probability Archive, we can step back and take an inventory of some of the more special games in recent years. I've created a simple search tool for finding many of the most compelling games of the decade. There are many things that make a game special. Any game with playoff implications is more interesting than one between mediocre teams, and playoff games themselves are obviously critical. But many of those games are just plain boring. They're sometimes duds, decided by the end of the 1st quarter. I wanted to know what the most exciting games were purely between the sidelines, what were the biggest comebacks, and which teams played the most dramatic football. That's why I created two new indices--Excitement Index (EI) and Comeback Factor (CBF). Admittedly, these stats are purely from a spectator's perspective, and would have very little application to the game itself. But hey, it's fun. The comeback index was easy. For any given game, the 'CBF' is based on the lowest win probability at any point for the ultimate winner. To make bigger comebacks have bigger CBFs, I made CBF be the inverse of the lowest WP. For example, if a team is down by 10 with 10 minutes left in the 4th quarter, they'd have around a 0.13 WP. This means the trailing team has a 1 in 8 chance of winning, and the CBF is therefore 8. A team that comes back from a 0.01 WP, would have a CBF of 100, the largest possible. You might be tempted to say that CBF should factor in the lateness of the comeback. Certainly, a comeback in the final minutes is more dramatic than one staged in the 3rd quarter. I agree, however WP already factors that in. A 17-point lead in the 2nd quarter has an equivalent WP as a 2-point lead late in the 4th quarter. "Excitement" was harder to measure. Unlike measuring comebacks, there is no single true measure of excitement, and different people can have different definitions. I tested a few different methods, including several suggested by commenters, and ultimately chose a method that I think is both effective and straightforward. What about measuring closeness? The closeness of a game is obviously an important part of how compelling it is. And EI captures that too. The closer the game is to a 0.50 WP, the more magnified the WP movement becomes for any given play. For example, a 40-yd pass to the 10 yd line when the score is 30-6 is going to move the WP by barely 0.01. But that same play when the score is tied will move the WP by 0.25 or so, depending on the time remaining. But games with more plays will obviously have a higher WP. Shouldn't EI account for the number of plays by using the average WP movement? I say no. A fast pace helps make a game exciting. Offenses furiously trying to score as quickly as possible is fun to watch. Pace counts. Plus, overtime games would tend to have the most plays, and therefore the higher EIs. And that's what we'd expect from an OT game. If 'sudden death' is anything, it's exciting to watch. Below is the search tool, and here is its permanent home. Just enter a year, a team, and whether you want to rank games by excitement (EI) or comeback (CBF). Or you can select 'any year' or 'any team' to find the most interesting games for the entire league in any year, or for the entire decade. Excitement Index needs some tweaking (which you admit), it's got the Eagles/Bengals tie as the #2 game this year. There was nothing exciting about that game at all. As Merrill Reese said "if there were ever a game where neither team deserved to win, this is it." I disagree about the PHI-CIN game. I watched the end of it, and it was tense despite the mistakes--"Down to the wire" as it gets. Look at the end of regulation. Sure, missed FGs or botched handoffs on the goal line are bad football, but its undeniably exciting football. But I'm glad you point out that game. My EI calculation doesn't know what to do with ties right now. So to be accurate, that game's EI should be .5 less than it says. It should be 7.6, not 8.1. But it would still be the 2nd "most exciting" for 2008. Well, any game tied late and any OT game is going to have by nature some excitement. But that game was the least exciting OT game you could have. It was sloppy, poorly executed and the first 55 minutes or so were boring. I should mention though that I am an Eagles fan. I was at that game! It was exciting, sort of. But mostly, it was just poorly played. There was a blizzard, leading to a lot of missed field goals that should have ended the game, and some really sloppy, goofy plays. We were rooting for a tie. It's fun to click around and look at some memorable games. It'd be interesting to see a chart for the 1993 playoff game between the Bills & Oilers... seems like that one would redefine the "comeback factor"! Have you thought about using Comeback Factor as a validity tool? For example, when I just asked for the biggest comebacks, the first page alone had 30 games with a 100% comeback going only into 2006. But if I assume that means that the losing team had a 99.9% chance of winning at some point during the game, this comeback should only happen .1% of the time. With 267 games in a season (including playoffs) and 9 seasons, there are 2403 games and we would expect to only see something with a .1% probability about 2 and a half times. So does a team at 99.9% at some point in the game not actually have a 99.9% chance of winning, or is something else going on? Good point. Yes, but the figures you're using are a little off. A CBF of 100 = 0.01 WP, not 0.001. So the losing team had a 99% chance instead of a 99.9% chance. Models like this are always just estimates, and it's not truthful to claim my model is that accurate, particularly near the extremes of 0% and 100%. Also, remember that EI captures the lowest observed WP at any point in a game. There are a couple hundred observations per game, so were talking about half a million observations, not 2400 games. I have a calibration graph that I'll post soon, and the model I'm using is nearly perfectly calibrated. That is, when it says the WP is 10%, those teams win 10% of the time. When it says 99%, those teams really win 99% of the time, and so on. Ok. Thanks. There are a few errors in the NFL gamebooks these are based on. I need everyone's help to flag those games so I can make manual corrections. I'll do that now for those games. The 04 playoff games are simply my own oversight. Those 2 games are fixed. 2004 playoffs restored. Thanks, Shake. I know that's you. You might have to clear your browser cache to purge the original xml file. I had to. I'll never forget that game. I watched it Korea (with the announcing in Korean!) It was on a tape-delay and a lot of the dead time from commercials, time outs, and replay challenges were edited out. I didn't know the outcome, and so it was incredibly exciting to watch. I think I learned how to say "they need to establish the run" in Korean. The #2 comeback game (Balt 24, SD 3) is also fishy, due to a weird spike in SD's win% after Trent Dilfer kneels down very late in the game. BTW, Altavista says "They need to establish the run" in Korean is 그들은 뛰기를 설치할 필요가 있다. Good luck with that! There's an error in the Most Exciting Game Ever. Nothing happened at the end of the game to cause the final spike. I read the write-up. What causes the chart to dive to 80% Buffalo as the Patriots set up to win the game? It's the very last dive in the chart. Awesome blog. Even more awesome that my Buffalo Bills are in the top 3 most exciting games of the decade! ESPN reported today Steelers-Raiders game featured five lead-changing TDs in fourth quarter, only third time in NFL history. Where does this rank on your EI list? Anonymous on October 21 is correct about the 12/17/2000 game. The Patriots get a first down, and suddenly it spikes to Buffalo having the advantage. Does the data think that the Bills have the ball. It seems to me that the most impressive comebacks are ones that involve coming back from a large deficit. Most of the top CBF games involve a short missed/blocked FG late in the game, which is certainly exciting but more about a single fluke play than a long, concerted comeback. Perhaps the issue is a matter of semantics. Given that my definition of a great comeback involves fighting back from a large deficit, I feel WP needs to be weighted by the game time/quarter when calculating CBF. 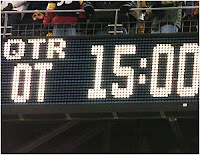 Because WP already accounts for the lateness in the game, being down 7 with 10 seconds to go might be an equal WP to being down 35 with 30 minutes to go, but I imagine most people would regard the latter as the greatest comeback ever, while blocking a last second FG and returning it for a TD to turn sure defeat into victory is as exciting as football gets. However, your table shows the scores, which would spoil the games. You should have a toggle or something to hide the scores.